I’m delighted to be chairing one of the sessions at the XXIII AMMPE conference 2018 in November. 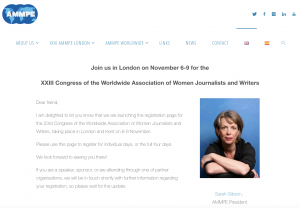 This is the annual gathering of the Worldwide Association of Women Journalists and Writers, and this year it is being hosted in London. I’ll be chairing a session on storytelling in the digital age at Google News Labs in Kings Cross, with a panel that is scheduled to include Nic Newman, Guardian data editor Mona Chalabi and the BBC’s Radharani Mitra.